This week has been all about teething. We’ve seen an improvement in Little M’s sleep since we started the move to formula, and switched her routine up a little bit, which I really must get round to writing about. But even though she’s fallen asleep a bit earlier and skipped the several hours of wakefulness between eight/nine and midnight, she’s been crying in her sleep an awful lot, often needing a cuddle before she goes back to sleep. This has meant that I’ve spent most of the nights this week half in her Snüzpod with her! I think the culprit is teething. Well, now the week has passed, I’m certain that the culprit was teething! On Friday morning, two little white slivers appeared through her lower gums. I was so excited to see them, I clapped and cheered. Little M looked at me as though I’d lost the plot! Obviously it warranted a text to hubby who seemed equally excited at the prospect of teeth. Mainly because he’s super competitive and Little M’s two closest baby friends have both got their teeth! 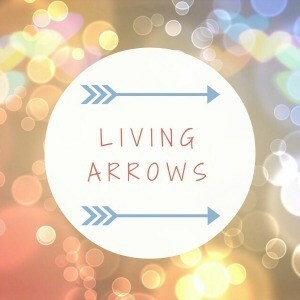 So I had to choose this celebratory photo for this week’s Living Arrows. It’s felt as though these teeth have been coming forever. It feels like we’ve had months of drooling, red cheeks and tears. I’d been checking her gums incessantly for signs but to no avail. We’ve been using a mixture of cucumber fingers at mealtimes (I think the cool texture of them has gone down well) and anbesol at bedtime, bringing out the big guns with a bit of calpol when Little M has been inconsolable. The week before last she was absolutely full of snot (but with no other signs of a cold) so I put that down to teething, too. But still no teeth! I had no idea that the whole process could go on for so long before any teeth would appear! At least they have finally started coming through now; hopefully Little M can have a break from the pain. "Meet the Parents – Advice for New Mummies and Daddies from Chilling with Lucas"
Haha thanks, it took a lot of takes! My favourite one of her is one where she’s holding the card upside down! What a gorgeous smile! 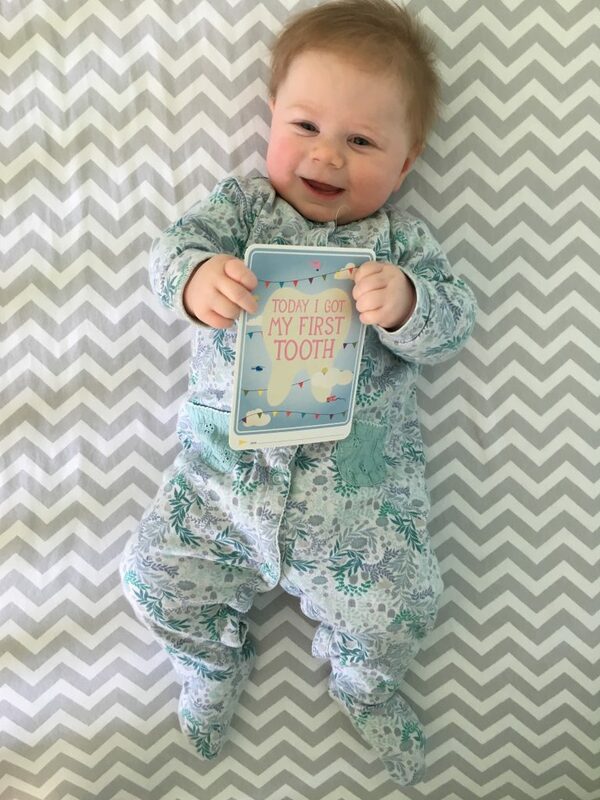 We got our first tooth at the start of December and have 6 through now! Wow sounds like they come thick and fast once they get going!